Allscripts' revenue was up 23 percent and earnings up 142 percent for the second quarter of 2018. Cerner's revenues were up 6 percent, but earnings were down by the same number. 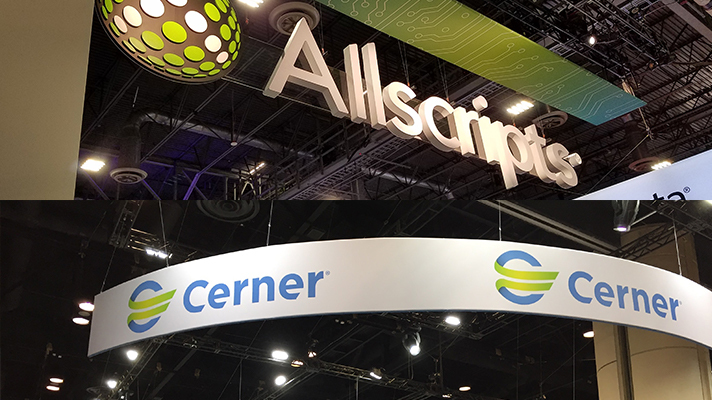 Two of the largest publicly-traded health IT vendors have some very different priorities for 2018 and beyond, as Allscripts focuses expanding its scope offerings to an array of different clients and partners, while Cerner knuckles down for the ongoing rollout of the Defense Department's MHS Genesis and the looming VA modernization project. On its earnings call, Allscripts President Rick conceded that the company was a "bit disappointed" with the quarter's booking of $278 million," and said long sales cycles and timing uncertainty could lead to more "quarter-to-quarter volatility" ahead – but he expected some but said its remains "very confident in our pipeline of opportunities." Allscripts CEO Paul Black pointed to double-digit revenue growth and the fact that Q2 earnings per share were "the highest they've ever been" under the current management team. The executives said they're prioritizing innovation on a number of different fronts, from precision medicine (the company is "just scratching the surface" of what its 2bPrecise platform can do for its EHR clients, said Poulton) to interoperability: the Allscripts Open API platform just crossed the 4 billion data share milestone, Black noted. "Today more than 8,000 registered developers have accounts on Allscripts Developer portal," he added. "This vibrant community of entrepreneurs and their collective innovation creates a key competitive advantage for Allscripts." He noted the company's continuing track record of strategic investments, such as its acquisition this spring of patient communication platform HealthGrid, which helps position Allscripts for the era of consumerism, and its addition of Netsmart, with aims toward post-acute care. In addition, growth of its payer and life sciences business, analytics offerings for "driving additional value from our pharmaceutical clients," and ongoing R&D spending in general, are meant to continue to Allscripts' evolution for a diversifying healthcare space, said Black. Cerner, meanwhile, enjoyed a "solid Q2, with all key metrics coming in at or above our expected results," said Chief Financial Officer Marc Naughton. Bookings were up 9 percent over the same period 2017, "largely due to the initial task orders for the Veterans Affairs contract that was announced in May," he said. Indeed, now that the deal is officially signed, sealed and delivered, the VA promises to take up much of the company's bandwidth in the years ahead. Cerner President Zane Burke offered updates on that initiative, as well as the ongoing rollout at the Defense Department. With regard to MHS Genesis, "we remain on track to begin the next wave of implementations later this year," said Burke, noting that DoD upped the contract ceiling for MHS Genesis by $1.2 billion to include the Coast Guard and other expanded scope. As for the VA, "we believe there is great potential for a broad industry impact," Burke added. "At the core of this project, Cerner will enable seamless care through a single system that links both veteran populations totaling more than 18 million people, while also delivering national interoperability to the commercial market." Both of those projects will also help Cerner boost its efforts across the board in population health, open platforms and telehealth, he said, "all of which have relevance to our commercial client base." Burke also offered some further insight into the intriguing value-based care partnership it launched with Lumeris this past month, which will see the launch of an "EHR-agnostic" technology, called Maestro Advantage, to help health systems manage Medicare Advantage plans and other risk-based reimbursement models. "It will provide connectivity across the provider health plan and consumer, and will be designed to improve outcomes and lower costs by embedding actual insights into the provider workflow," he said. "It will include a unique accountable care clinical model that supports a health system's development of a high-performing integrated delivery network and shared savings with providers through value-based incentive alignment."